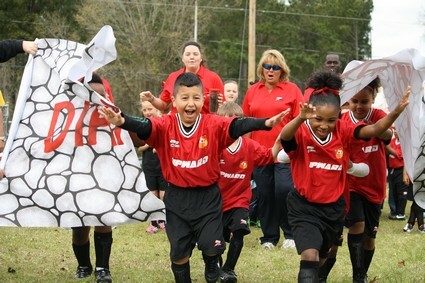 Summer Grove United Methodist Church in Shreveport recently completed its third season of Upward Soccer. This year the project attracted 110 children playing on different teams within Summer Grove’s league. During practices, team leaders offered devotions for the children, who were given scripture verses to memorize. The season ended with fellowship, fun and food at a church-hosted celebration for more than 200 people. The program, used as an entry way into the life of the church, has served 400 children in three seasons. Pictures by Joanne Black.